Last week I read the Wired Cloudline blog Beyond Google’s Reach: Tracking the Global Uprising in Real Time which talked about the search engine Topsy, which is designed to “rank people, not pages,” as Google does. Topsy is an entirely different search engine model than Google, and therefore can pick up and aggregate information from social media in perhaps a different way than Google. A case was made that suggested that Google did not pick up tweets on the October 15th protest at Occupy Wall Street as efficiently as Topsy. Google is picking up newspaper articles and newscasts, such as “Opinion: Occupy Wall Street is a vigil, not a protest,” New Jersey Star-Ledger, “Occupy Wall Street kitchen slowdown targets squatters,” NYPOST.com, “Occupy Wall Street in the Age of Technology”, Huffington Post, “Most Americans Aren’t Occupy Wall Street’s ’99 Percent’ The Atlantic. Note that the Google search is producing articles that were published as much as three weeks ago, while the Topsy search is displaying tweets written just 18 minutes ago. In the realm of tracking events of local or global importance, it would seem that a combination of these two types of searches would be best, so that we have well researched articles side by side with the up-to-the-minute crowdsourced view of the bystander. On the one hand, in-depth reporting of a body of knowledge on an event is always useful in tracking history and trends, and offering insightful perspectives. What is published in newspapers, magazines and books is thought to have staying power, whereas we are not yet sure how long the impact of a tweet or Facebook post will last. The veracity of tweets is questionable, and they are posted before anyone has a chance to check whether they come from reliable sources. When several sources convey the same message, however, it can indicate that something is really happening at a given location. Topsy can be important in tracking social movement such as the progress of an uprising or movement of a group of people. There is power in numbers, so the sheer number of people who will protest now using social media may increase because they have more confidence in doing so when they know others are of like mind. 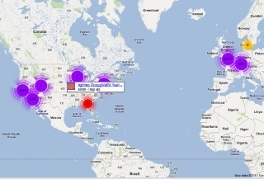 One month into the Occupy Wall Street protest, the internet is populated with maps depicting activity around the event, not only in the U.S. but in other countries as well. The movement has inspired map makers who may have been headed in another direction, such as Humphrey Flowerdew, who along with his partner, Trung Huynh, both based in London, were originally in business to use their Crafivy to aggregate and map real estate listings. The Cravify Occupy Wall Street map shows tweets from throughout the world with the hashtags such as #occupywallst, #occupylsx, #occupyrome, #occupytokyo that are frequently updated. A blog/article in yesterday’s New York Times entitled “Tweets will Soon Come with A Dateline” talks about how location is now coming to Twitter! What are the advantages of a location-aware Tweet? Twitter users could choose to read all Tweets posted by people in their general location – be it neighborhood, apartment complex, or city. It might also be useful to locate the whereabouts of loved ones during a catastrophe such as earthquake or flood. It will be interesting to see what developers come up with to meet this new demand.